I know there’s some Japanese show where they put large, exotic insects in glass jars in order to induce fights between them — this is the kind of thing some people find entertaining. I don’t find as much entertainment value in the spectacle, but I know how it feels to be an insect like that, trapped in others’ personal space. 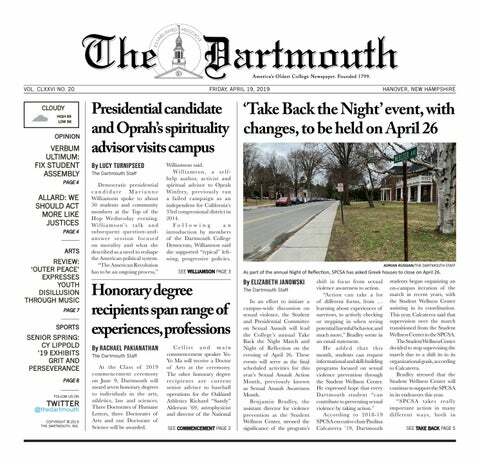 Unlike a certain peer institution of ours located in Connecticut, Dartmouth is totally without walls. But “stone walls do not a prison make.” Like the cockroach pawing frantically at the glass, fighting against a barrier it cannot even understand, so I feel on some nights, like I’ve been swaddled in invisible bonds to the core of this place. I twist my neck and wince to avoid the feeling of so much eye contact and breath down my neck. Even when I’m home on breaks I don’t feel released, but like I’ve just picked up my ankle chain and dragged it hundreds of miles down to Texas — a single tug from its keepers at the other end could wrench me to my knees. It is peculiar how we meet and re-meet people. It is also peculiar how we remember and re-remember them. Freshman year, I’m at the Avicii concert, spangled in neon, but just not pumped up enough to feel fun. Briefly I see a girl whose name I know from Facebook. I snap some judgments, wonder whether I could or should ask her to dance, disappoint myself and choose not to. A meaningless event. Well over a year later I get a blitz two-feet-long in all blue text from this same human about something that I had written, a blitz that launched over a year of meaningful and wonderful and painful events. I remember so well the first time I ever saw her. Why? Another time I’m distraught in a huge graveyard in Berlin, trying to disinfect myself of memories of something different altogether. I’m a quarter of the way across the world, but the cutting loop of Hanover is still around my waist. I’m sitting for hours in front of hundreds of graves of Italian boys who were killed at my age. I’m returning to Dartmouth the next term, straight to the center of the glass jar to see all the people I want to see yet petrified at the almost certain eventuality that I’ll see one person. In the course of one evening, a name you hear tossed around becomes a person, then by morning your entire world, and after many sprains and snaps and lacerations, back to a name. Even that name can’t be flattened down dead — it tugs too. It resists death with as much aching fortitude as the roach in the jar. A thrashed memory of love that felt true at the time lies in the dark on the floor of the mind, still twitching horribly. At FoCo I’m eating alone and a friend walks by. “Alex, look at this,” I say as I hand him my phone and he thumbs through a couple harsh texts. “I guess this is just like, really over.” “Nah,” he laughs. “It’s never over.” “But I want it to be.” I actually, honestly, pathetically sent the following quotation in an email once, seized from a very sad, very good book. It was about how months of silence was not working to stamp out how violently haunted I continued to feel by my memories: “I caught him with an unseen hook and an invisible line which is long enough to let him wander to the ends of the world and still to bring him back with a twitch upon the thread.” No one ever falls out of love, and no one ever leaves your life. You are pierced through with hook after hook, all tied to all the people you trusted enough to puncture you, make you vulnerable. But vulnerability is irreversible. At such a small school, with tall psychic walls that keep us in such close quarters, people will enter and re-enter your life no matter how far you retreat into the inner citadel. They will tug open closed wounds in ways that can feel masochistically ecstatic. You get older as you hurt and are hurt by more people. One by one, the worst days of your life drop from the high, imperceptible branches of the hypothetical future down onto lawn around you to rot, never to be completely washed away. This is how life is worse than prison. An inmate knows that iron bars and cinder blocks confine him in only a material sense — for what human hands can make, human hands can break. Yet we are fastened to our past in a chain gang with everyone we’ve loved and there is no escape, no matter how we cry and claw at it. A bell cannot be unrung. You cannot take back a kiss. Happiness begs that we give up and learn to feel affection for the stinking, unkillable albatrosses that swing around our necks. Or else die young.